Linda occupied her days buying clothes… [Fabrice ] took an intense interest in her clothes, looked them up and down, made her parade round her drawing-room in them, forced her to take them back to the shops for alterations which seemed to her quite unnecessary, but which proved in the end to have made all the difference. Linda had never before fully realized the superiority of French clothes to English. In London she had been considered exceptionally well dressed, when she was married to Tony; she now realized that never could she have had, by French standards, the smallest pretensions to chic. The things she had with her seemed to her so appallingly dowdy, so skimpy and miserable and without line, that she went to the Galeries Lafayette and bought herself a ready-made dress there before she ventured into the big houses. When she did finally emerge from them with a few clothes, Fabrice advised her to get a great many more. Her taste, he said, was not at all bad for an Englishwoman, though he doubted whether she would really become elegante in the true sense of the word. 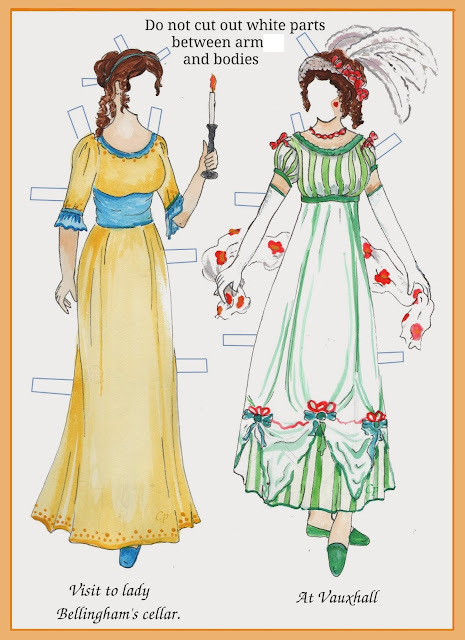 In an earlier entry on this book we advanced the theory that Linda isn’t as appealing to readers as she is to the characters in the book – Davey and Lord Merlin have quite unlikely passions for her, while Fanny loves Linda’s child more than her own, and it all gets a bit much. But Mitford does have her moments of steel. The closing lines of this book are quite remarkable. Fanny protests that Fabrice was the great love of Linda’s life. Links on the blog: More Nancy Mitford all over the blog, click on the label below. Proper clothes shopping in London in the same era in this entry. 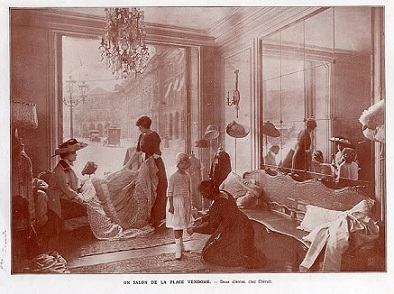 The picture is of the Cheruit salon in Paris. Cheruit designs featured in this entry and this one. Moira - That whole world of buying elegant clothes has a mystique to it even if Linda isn't exactly one's favourite character in the book. Interesting too how some people become true francophiles and some true anglophiles.